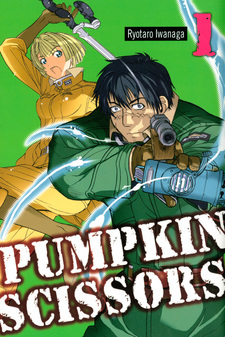 Pumpkin Scissors had five volumes published in English by Del Rey from November 27, 2007 to August 25, 2009, before the publisher became defunct. Kodansha Comics USA has taken over the license, and has been publishing the title digitally since August 2, 2016. Honestly speaking, despite this being pretty old and still running today, it hasn't gotten boring even in the slightest. The whole idea or premise is definitely promising and the execution of it, was definitely good despite it having a little bit of a slow start. One of the main characters, Lieutenant Malvin, has a rather hard to swallow personality to phrase it nicely. She is however, getting better as time goes on due to the learning process and development of her character, so that is a plus since I was afraid of her never getting any better. Regarding the story, I think that there is a lot that hasn't been filled in yet, but a lot has also been revealed and the fact that it hasn't run out of new things to know about, is outstanding and hard to pull off. I could say more about the other characters, but I just suggest reading it. It's one of the best manga in my opinion right now. My first review, excuse me in advance for my clunky english. Really solid (And I mean SOLID) manga about the aftermath of a long war, the social, political and technological consecuences of such a war and the personal tragedies (and good fortunes) of the people involved in it. One point I really liked about this manga is the discourse, specially in the later volumes, about the discrepancies between technological and social advancement in a particular society. Technology advances a lot faster than social conventions and, like in our own world, we get to see how most of the people making the decisions are not prepared to understand the applicability of new tech and legislate accordingly. Every now and then the author goes into somewhat deep explanations of the technology and methodology of several branches of sciences, and even the basics of the philosophy of science itself and it's ethical ramifications. The manga also goes deep into the characters motivations and evolution, and even secondary or tertiary characters get fleshed out quite well. On top of all this, you also get a healthy dose of action, quite realistic even, not scared of going into real gore at some points. 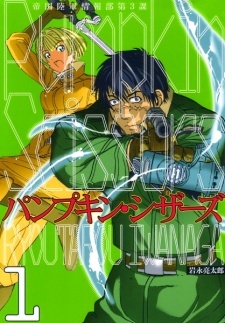 About the art, at the beginning is a bit basic, but improves along the manga. I particulary like the characters expressions, with a wide and carefully drawn repertory of feelings to enjoy while reading it. In short, totally recommended, specially for those who like to read about how the different government branches operate and how the individual people in them face the challenges of a rapidly-changing society and the problems that arise from war, be them recent or long-going.